The South Indian bath braid you need to know. “Kulli Pinnal” literally translates to ‘bath braid’. 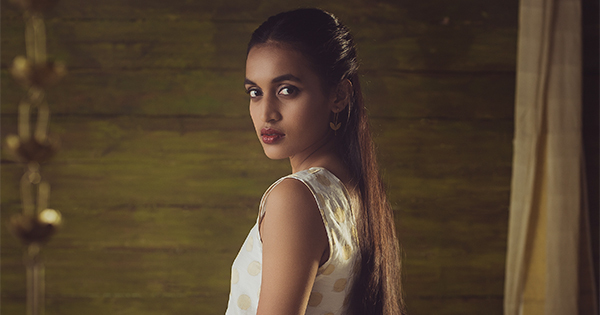 Traditionally worn by Malayali women, it is a post-shower style that sets your hair in bouncy waves. Here’s a modified version that you can wear to work and will carry you through to your after-work plans. Step 1. Create a centre parting and brush the rest of your hair back. Separate the front 2 sections by creating an ear-to-ear parting. Step 2. Create a half ponytail by bringing the left section and the right section to meet at the back of the head. Insert the tail-end of the ponytail into the intersection. Step 3. Pull out the inserted section and secure it with a hair elastic. Step 4. Make a fishtail braid till the end and secure it with a hair elastic. To make the fishtail braid, pinch a piece of hair from far end of the right part, and cross it over joining it to the left part. Next pinch a piece of hair from far end of the left part, and cross it over to join the right part.